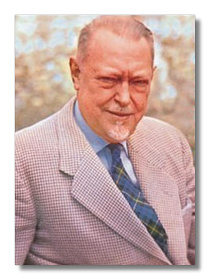 Composer, teacher, and one of the most influential musical figures in the United States between the world wars, Howard Hanson studied in New York with conservative composer Percy Goetschius and at Northwestern University, outside Chicago. Somewhat of a compositional prodigy, he received his first academic appointment, not yet 20, at California's College of the Pacific. He became an academic dean at 23. Hanson's early compositions made him, in 1921, the very first recipient of the prize of the American Academy in Rome. In Rome, he studied both orchestration with Respighi and the great Renaissance and Baroque Italian painters and sculptors. In 1924, Hanson became director of the Eastman School of Music, building that school into one of the best conservatories in North America. He also founded an annual festival of American music, with performances both of contemporary composers and of composers of earlier generations. As a conductor, he developed a particular interest in the "Boston School" of composers – John Knowles Paine, George Whitefield Chadwick, and Horatio Parker among them. Hanson's early music combines elements of Jean Sibelius, César Franck, and Claude Debussy, but to list these influences to a large extent misses the point. Early work like the Concerto da Camera for piano quintet (1917) has interest but great awkwardness as well. Hanson hit his mature style in the Twenties with such work as the Symphony #1, "Nordic" (1922), the String Quartet of 1923, Lament for Beowulf (1925, and one of his most powerful scores), and the organ concerto (1926). None of these works show much trace of the new Modernism of Igor Stravinsky, Paul Hindemith, Arnold Schoenberg, or Béla Bartók. Hanson remained pretty much outside mainstream Modernism, with a sound and idiom instantly recognizable as his own. Many criticized him as musically reactionary, and yet his music could not have been written in the Nineteenth Century. There's a directness and concision, an avoidance of padding, more in keeping with Twentieth-Century ideals. His harmonies belong mainly to him, and he retained an interest in chordal combinations and odd scales to the end of his career. Hanson's music in the Thirties consolidated his musical discoveries with his opera Merry Mount (1933, another very powerful score, deserving revival), Songs from "Drum Taps" (1935),and the Symphony #3 (1938). The Forties brought about a restlessness in Hanson's idiom, as if he had found himself in a bit of a rut and wanted to get out. The idiom becomes harsher and the architecture more concise and more dependent on short thematic cells rather than on full-blown themes. Works of this period include the Symphony #4 "Requiem" (1943), the Piano Concerto (1948), and The Cherubic Hymn (1949). 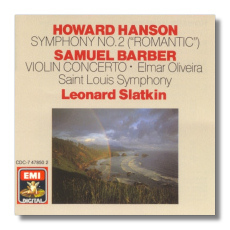 The Fifties and the Sixties – for me, Hanson's best period – inaugurated even more experimentation: Fantasy-Variations on a Theme of Youth (1951), How Excellent Thy Name (1952), Symphony #5 "Sinfonia sacra" (1954), Mosaics (1957), 4 Psalms (1964), Symphony #6 (1968), and Young Person's Guide to the Six-Tone Scale (1972). From the mid-Fifties on, Hanson's music began to disappear from concert programming. He still received prestigious commissions, but critics began to lose interest, particularly as post-Webernian serialism came to the fore. 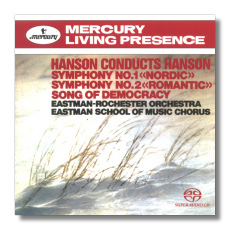 However, Hanson was nevertheless able to stay on the radar through his Mercury-label recordings of his own music and that of others – mostly conservatives, many products of the Eastman School, and his beloved American late Romantics. Almost all of these recordings have become classics and have rarely gone out of commercial distribution. 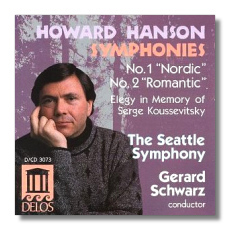 Recently, signs of a reawakening of interest in Hanson have arisen with, among other things, Naxos' Hanson series (including the first complete commercial recording of Merry Mount) and Delos' symphonic sets with Gerard Schwarz.